Hi! My name is Carol. I live in PA and I've been stamping about 7 years. I started scrapbooking about 15 years ago, and after I saw some pretty cards on the counter at the scrapbook store, I decided to take a class to learn how to make them. I was hooked and the rest is history. I have so many favorite items that it's really hard to name just one. I use both my Tonic paper cutter and my Scor-pal on a daily basis, so those are 2 items I can't live without. 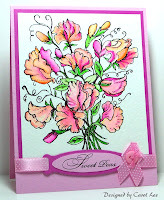 My favorite technique is embossing, either with embossing folders, embossing powders & ink, or stenciling with brass plates. I just love the look and there's a huge variety of product available for this technique. My favorite color is purple, but I use a wide spectrum of colors on my cards. I love doing color and sketch challenges which stretch me to create things I normally wouldn't think of doing, often with surprising results! I read about OWH on someone's blog and clicked the link. I knew it was the perfect way to get my cards into the hands of people who would appreciate and use them! I create cards mostly as a hobby, but it gives me a good feeling to know that when I'm donating them, I'm giving something back to these brave men and women who do so much for us! Beautiufl cards. Lots of inspiration. Thank you for sharing. These are really lovely cards Carol. You do very nice work! I always look forward to the "Featured Cardmaker" posts. Great job Carol!! Your cards are sooo pretty!! 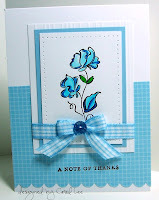 We can always use inspiration from other card makers! Maybe you'll give us some classes here with OWH?? Keep up the good work, as we need help for these troops of ours to keep up their spirits and this sure helps! Thanks for joining us!! Thanks for such kind and sweet comments! I'm very happy to have discovered OWH and I'll continue to contribute as long as I'm able. If there's any technique anyone needs help with, I'll be more than happy to lend a hand - feel free to ask anytime! Rock on, Carol! Your cards a terrific. Thanks for sharing your talent with us and our heroes! Well done!! I love your cards Carol, I will never get another card in a store again. So glad you can make my cards all the time so special. You are the best. Beautiful cards, Carol! Love your style and bright colors! Thanks for sharing your cards with all of us and more so Operation Write Home! Im soooo proud of you Carol and soooo proud and privileged to know you.... how lucky for me that im just a few houses away and have your incredible creations at my fingertips! 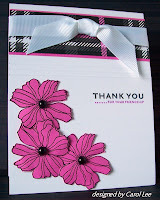 and what an amazing way to share your talents ...... you, like your cards, are something very special !